The paintings in Susannah Auferoth’s exhibit at the Grubbs Gallery in Easthampton, have one thing in common: They all use the template of three exact lines, two thick, the middle one thin, in colors with cavernous depth. Within this framework Auferoth has created individual expressions of movement and reflection on three plains: Earth, sky, and the space in between where life happens. Seven of these pieces are on view in her untitled show on The Williston Northampton campus now through the end of September. Auferoth created these paintings by layering oil paints and resin or beeswax over sequential images in motion on top of wood or paper. The action flirts with the horizon and can be glimpsed, in part, through the stained-glass-window looking space in between. Her use of color, at times, is reminiscent of American painter Mark Rothko’s work with hue and form, or lack thereof. In “Jump,” Auferoth started with a series of silhouettes documenting the arc skateboarders make catching air. 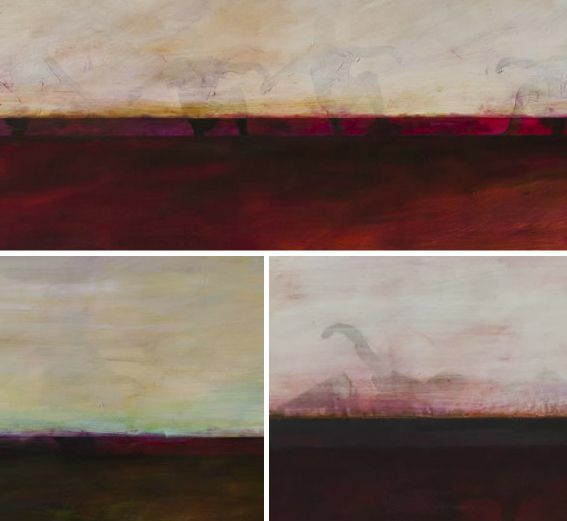 Then she added layers of red, blue, and black paint to the lower half of the canvas, a strip of Earth, which appears restless under the blood red-horizon and golden-flecked sky. The action is obscured and hidden, but you can see that the skateboarders have been grounded — none of them able to leave the Earth’s plain — but they remain tenacious in their attempts. “Begin” is playful and dark with the horizon completely engulfed by the Earth, which reaches up into the air with the grace of sea pen coral swaying at the bottom of the ocean. The colors and darkness makes this artwork feel like a birth. Peaking out above the horizon are arms raised in dance that look a lot like the long necks and cap-like heads of brontosauri. “Weiss” has the least discernible action and the most color variety of the pieces in the show. The Earth is a healthy field of golden-green under a deep-blue horizon and a cloudy azure sky. I enjoy how the sky and the Earth both seem to be born from the space in between. The word “weiss” is a German surname meaning “white” or “knows.” It’s also a type of beer, weiss beer, which is typically light in color and made from wheat. I have no idea how that applies to this work. When I arrived at the Grubbs Gallery last week, the walls were lined with Aureoth’s art, but difficult to access while the floor was being vacuumed following a welcome for new and returning students. But that’s the deal when you don’t pay someplace like a museum to view art, you must observe it in whatever environment it’s placed — and about half the time that means someplace busy and noisy. But the hum of the vacuum, the tempered voices of high school students still feeling each other out, and the quizzical looks from the maintenance man became part of the experience. The environment made sense at Auferoth’s show: the space in between, where life happens, should be active. Susannah Auferoth: Reception is Sept. 23, 1-3 p.m. Exhibit up through Sept. 29. Free. Grubbs Gallery, in the campus center at The Williston Northampton School, 40 Park St., Easthampton. Hours: Monday-Friday, 8:30 a.m. to 5 p.m.; Saturday, 1-5 p.m. The gallery is not open during school vacation. (413) 529-3000. susannah@susannahauferoth.com. Contact Kristin Palpini at editor@valleyadvocate.com.